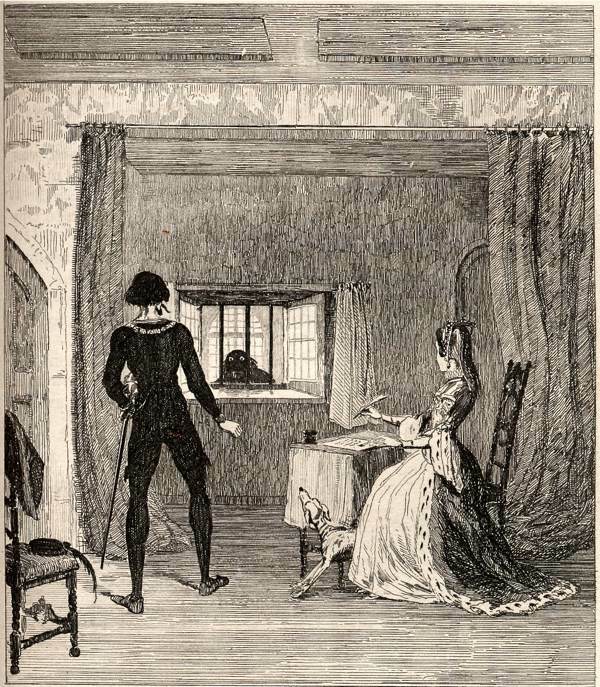 “It has been for years, the cherished wish of the writer of these pages to make the Tower of London the groundwork of a Romance,” wrote William Harrison Ainsworth in 1840, introducing his novel, “The Tower of London” – and it is an impulse that I recognise, because I know of no other place in London where the lingering sense of myth and the echoing drama of the past is more tangible that at the Tower. Each time I enter those ancient walls, am struck anew by the mystery of the place. 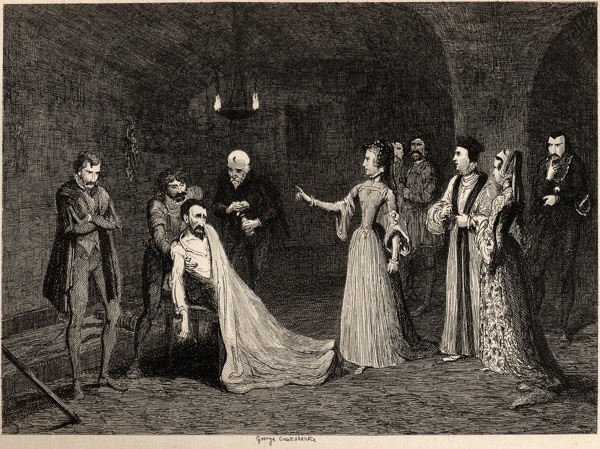 I have to stop and reconcile my knowledge of history with the location where it happened, and each time I become more spellbound by the actuality of the place, which in spite of Victorian rebuilding still retains its integrity as an ancient fortress. I make a point to pause and read the age-old graffiti, to stop in each doorway and take in the prospect at this most dramatic of monuments. 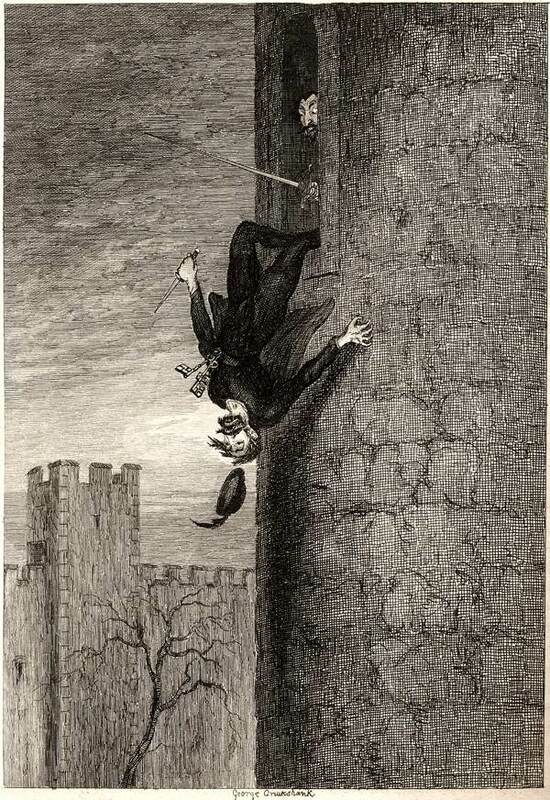 When I discovered “The Tower of London” by William Harrison Ainsworth in the Bishopsgate Institute I was captivated by George Cruikshank’s illustrations, realising that not only had this favourite of mine amongst nineteenth century illustrators once stood in exactly the same places I had stood, but he had the genius to draw the images inspired by these charged locations. 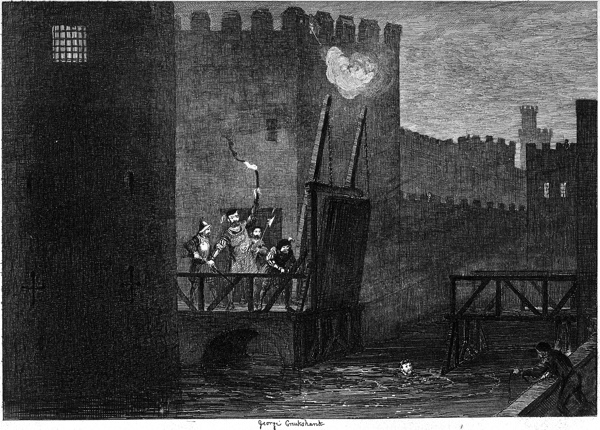 “Desirous of exhibiting the Tower in its triple light of a palace, a prison and a fortress, the author has shaped his story with reference to that end, and he has also endeavoured to combine such a series of incidents as should naturally introduce every relic of the old pile, its towers, halls, chambers, gateways and drawbridges – so that no part of it should remain uninvolved.” explained Ainsworth in his introduction to his sensationalist fictionalised account of the violent end of the short reign of Lady Jane Grey. 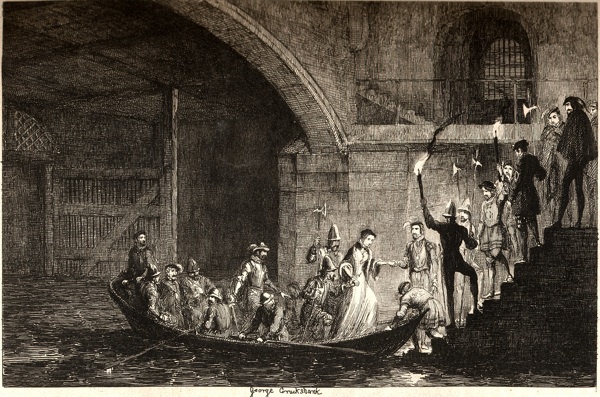 Yet it is George Cruikshank’s engravings which bring the work alive, providing not just a tour of the architectural environment but also of the dramatic imaginative world that it contains – and done so vividly that I know already that when I return I shall be looking out for his characters in my mind’s eye while I am there. 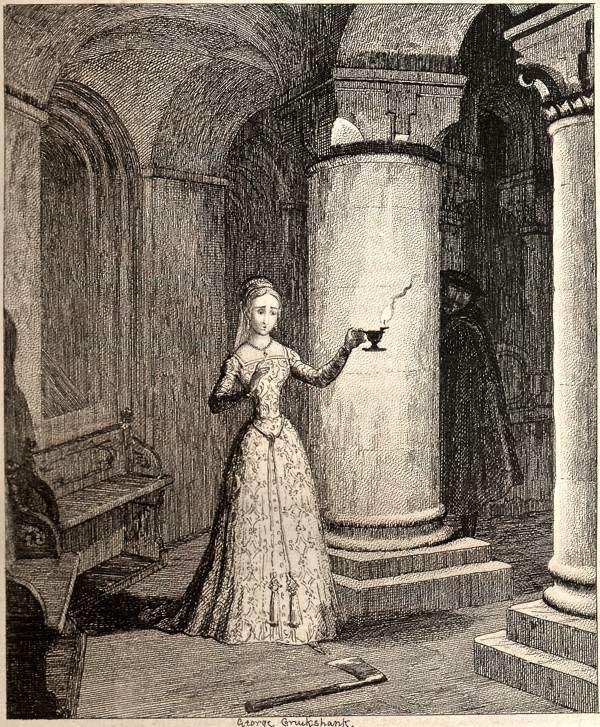 There is a grim humour and surreal poetry in pictures which, to my eyes, presage the work of Edward Gorey, who like George Cruikshank also created a sinister diaphanous world out of dense hatching. 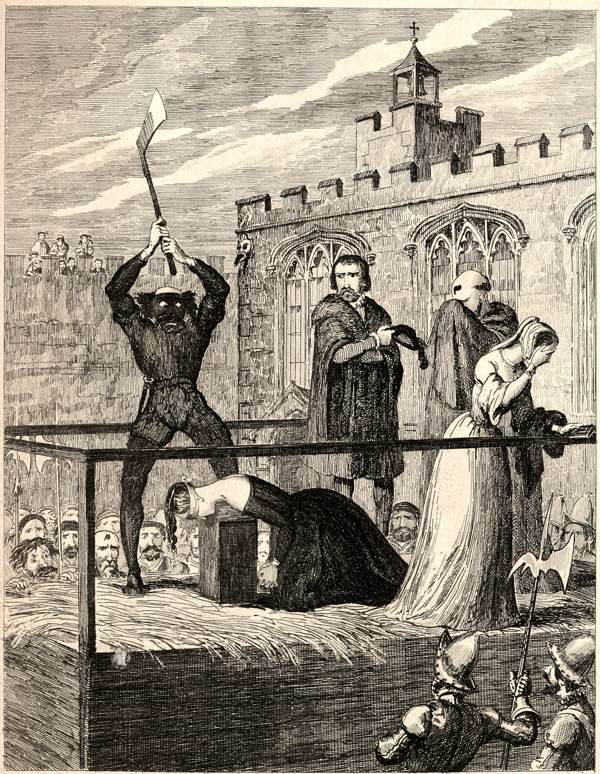 Maurice Sendak is another master of the mystery that can be evoked by intricate webs of woven lines in which – as in these Tower of London engravings – three dimensional space dissolves into magical possibility. 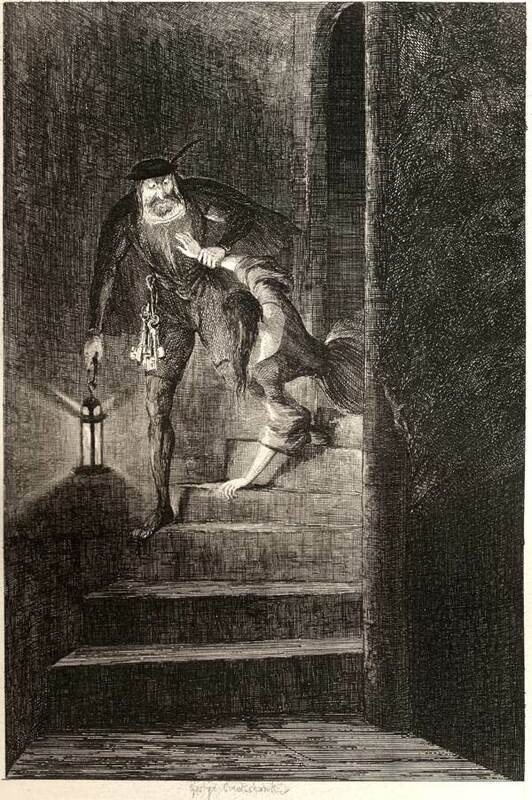 But to me the prime achievement of these pictures is that George Cruikshank has given concrete life to the Tower’s past, creating figures that convincingly take command of the stage offered by its charged spaces and, like the acting of Henry Irving, appear as if momentarily illuminated by flashes of lightning. 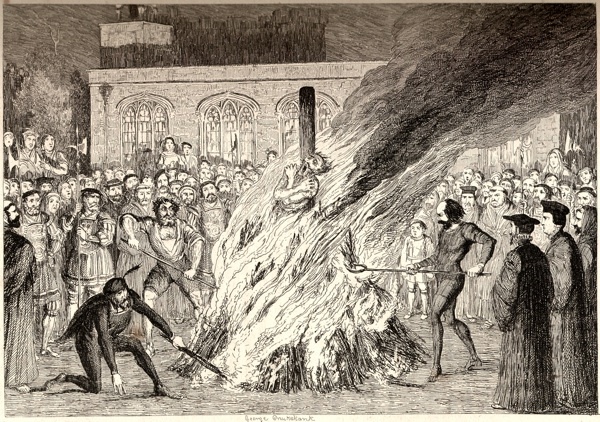 Cruikshank’s pictures are like glimpses of a strange dream, drawing the viewer into a compelling emotional universe with its own logic, peopled by its own inhabitants and where it is too readily apparent what is going on. 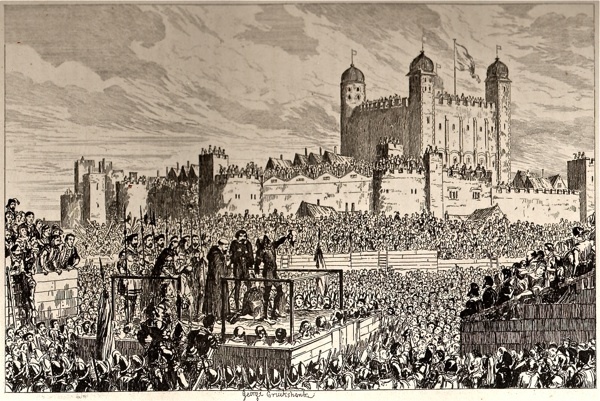 The popularity of William Harrison Ainsworth’s novel was responsible for creating the bloodthirsty reputation of the Tower of London which still endures today – even though for centuries the Tower was used as a domestic royal residence and administrative centre, headquarters of the royal ordinances, records office, mint, observatory, and a menagerie amongst other diverse functions throughout its thousand year history. 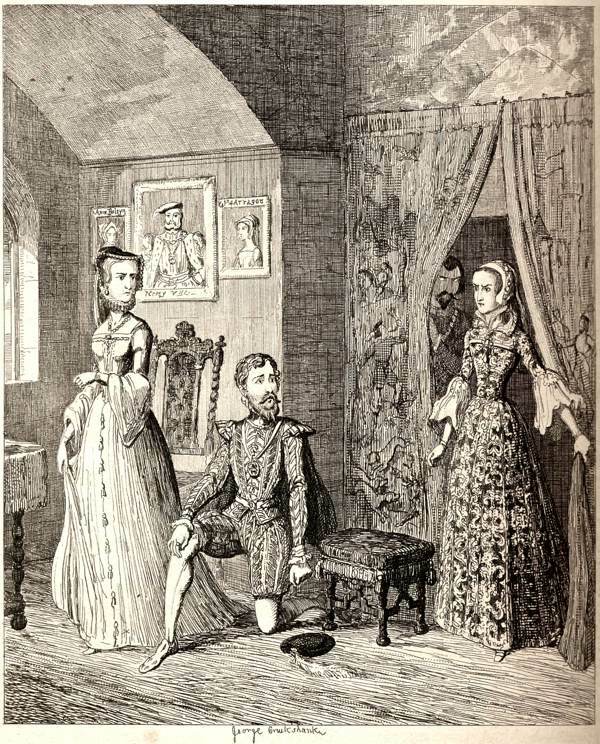 Yet although it may be just one of the infinite range of tales to be told about the Tower of London, William Harrison Ainsworth’s Romance does witness historical truth. 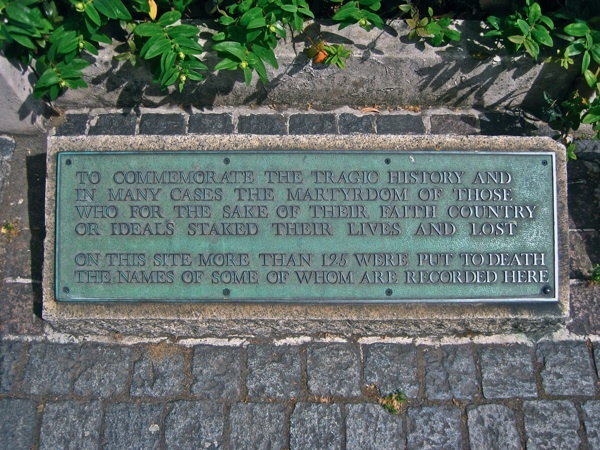 There is a neglected plaque in the corner of Trinity Green, just outside Tower Hill station, which is a memorial to those executed there through the centuries – as testament to the reality of the violence enacted upon those with the misfortune to find themselves on the wrong side of authority in past days. 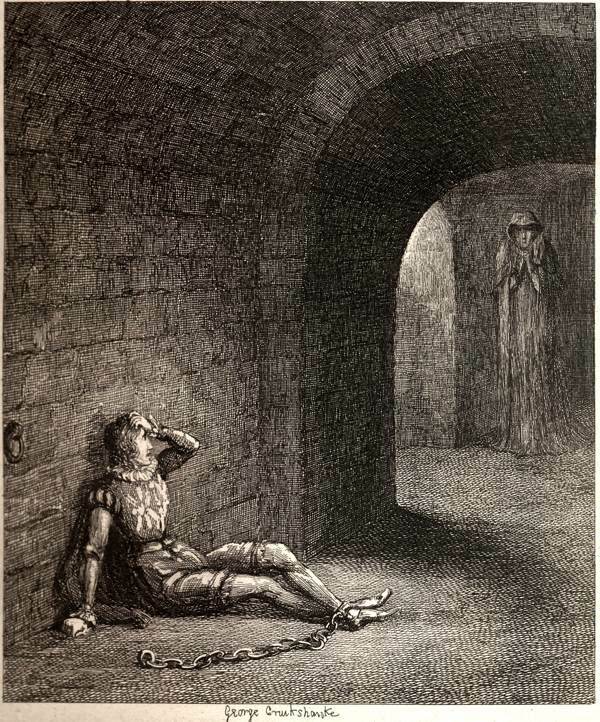 Cuthbert Cholmondeley surprised by a mysterious figure in the dungeon adjoining the Devilin Tower. 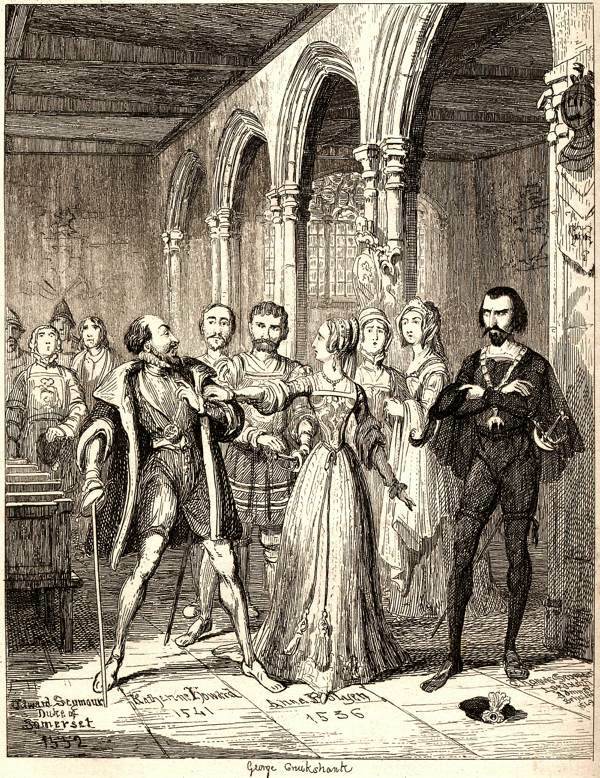 Jane Grey interposing between the Duke of Northumberland and Simon Renard. 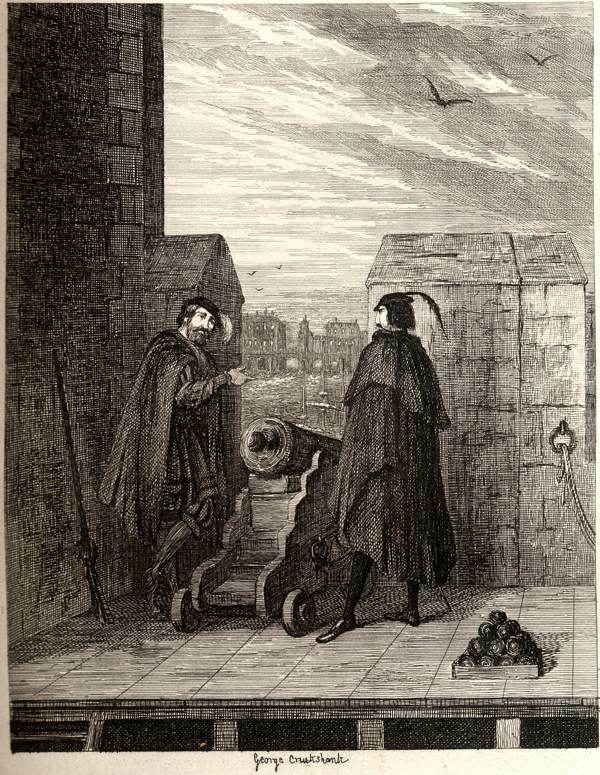 Simon Renard and Winwinkle, the warder, on the roof of the White Tower - “There you behold the Tower of London,” said Winwinkle, pointing downwards. 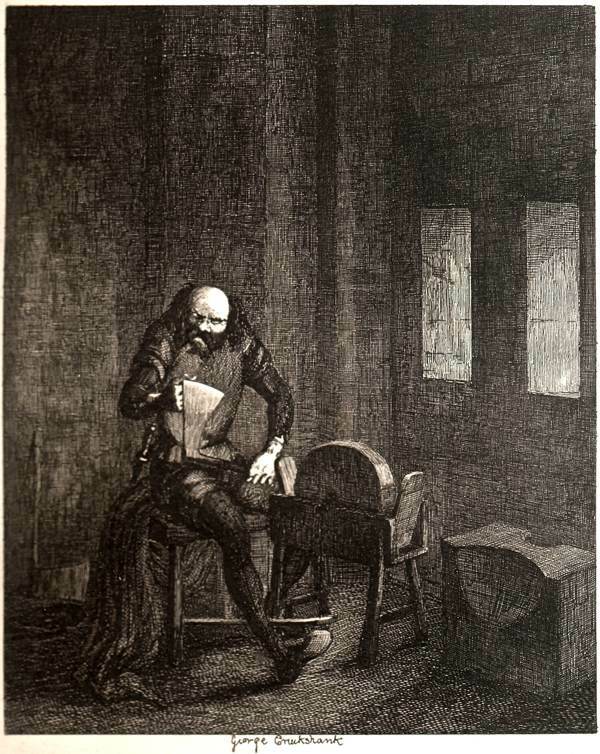 “And there I read the history of England,” replied Renard. 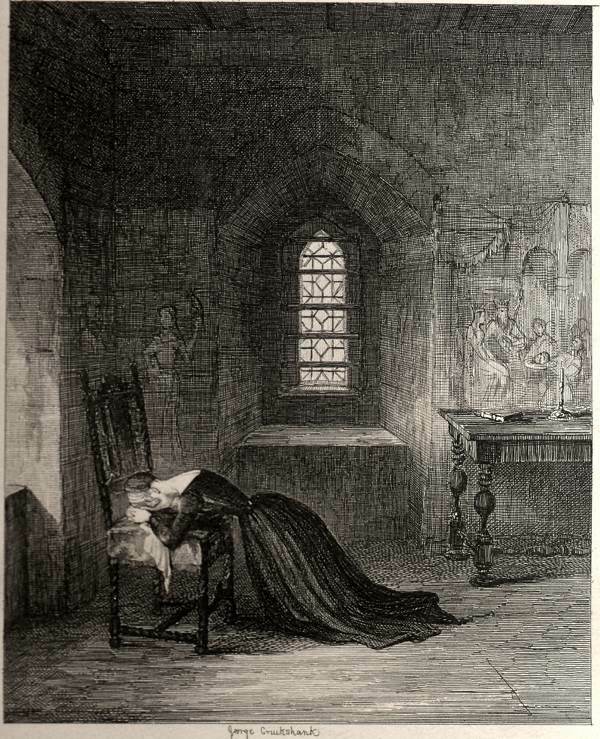 “If it is written in these towers, it is a dark and bloody history, ” replied the warder. The Oldest Ceremony in the World. 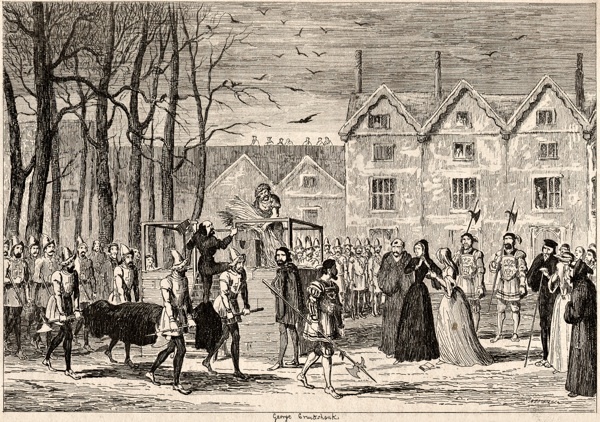 “Jane Grey interposing between the Duke of Northumberland and Simon Renard” shows a weird gallows humor with the principals quibbling while standing on the grave stones of Henry VIII’s wives. 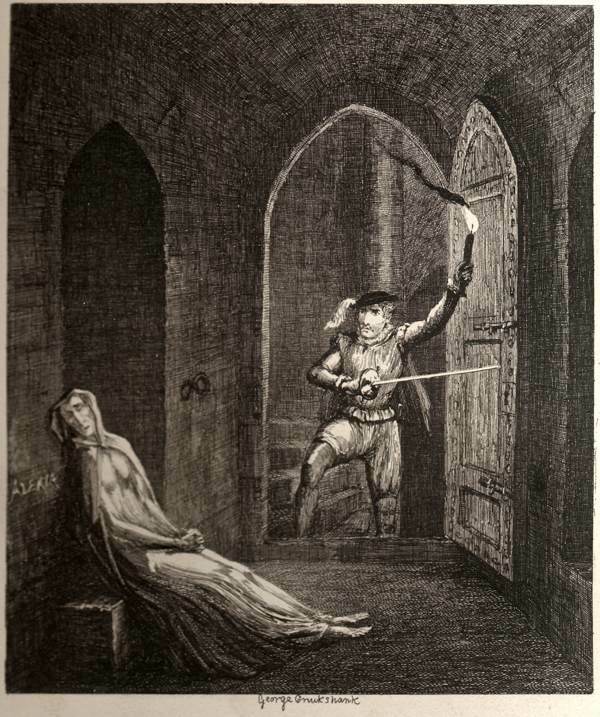 Thanks for a fascinating article made the more vivid by showing Cruikshank’s ‘grand-guignol’ illustrations. And wasn’t William Harrison Ainsworth a contemporary and friend of Dickens and author of over forty somewhat lurid ‘historical’ novels? I fear that after such lurid fare I shall have to seek out a Labrador puppy calendar. 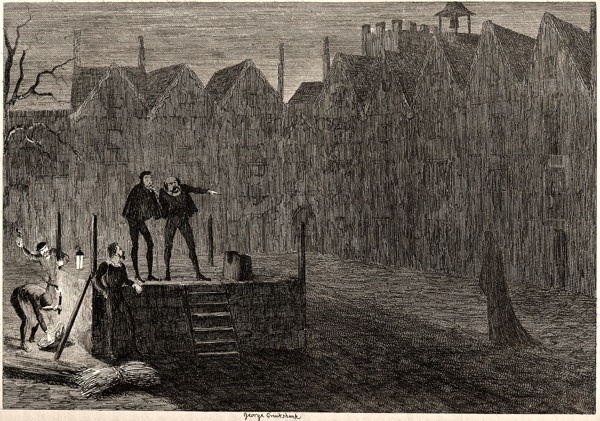 You are spot on with the Edward Gorey comparison, I looked at the images before I read your text, and thought exactly the same.